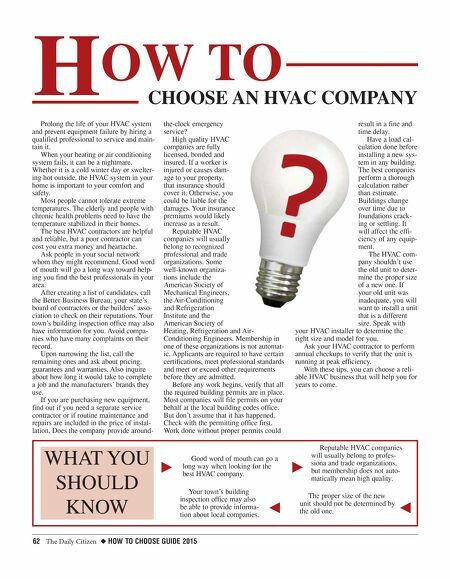 62 The Daily Citizen ◆ HOW TO CHOOSE GUIDE 2015 Prolong the life of your HVAC system and prevent equipment failure by hiring a qualified professional to service and main- tain it. When your heating or air conditioning system fails, it can be a nightmare. Whether it is a cold winter day or swelter- ing hot outside, the HVAC system in your home is important to your comfort and safety. Most people cannot tolerate extreme temperatures. The elderly and people with chronic health problems need to have the temperature stabilized in their homes. The best HVAC contractors are helpful and reliable, but a poor contractor can cost you extra money and heartache. Ask people in your social network whom they might recommend. Good word of mouth will go a long way toward help- ing you find the best professionals in your area. After creating a list of candidates, call the Better Business Bureau, your state's board of contractors or the builders' asso- ciation to check on their reputations. Your town's building inspection office may also have information for you. Avoid compa- nies who have many complaints on their record. Upon narrowing the list, call the remaining ones and ask about pricing, guarantees and warranties. Also inquire about how long it would take to complete a job and the manufacturers' brands they use. If you are purchasing new equipment, find out if you need a separate service contractor or if routine maintenance and repairs are included in the price of instal- lation. Does the company provide around- the-clock emergency service? 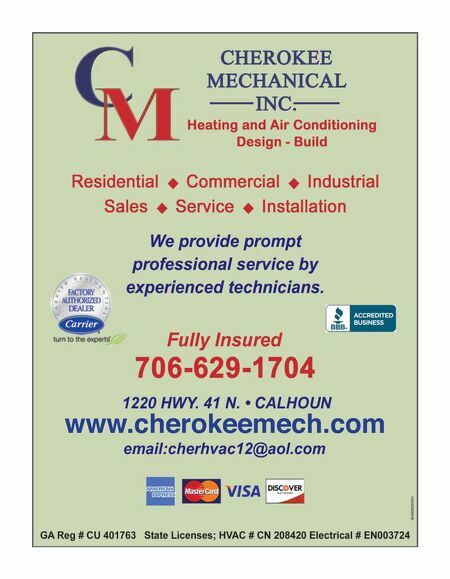 High quality HVAC companies are fully licensed, bonded and insured. If a worker is injured or causes dam- age to your property, that insurance should cover it. Otherwise, you could be liable for the damages. Your insurance premiums would likely increase as a result. Reputable HVAC companies will usually belong to recognized professional and trade organizations. Some well-known organiza- tions include the American Society of Mechanical Engineers, the Air-Conditioning and Refrigeration Institute and the American Society of Heating, Refrigeration and Air- Conditioning Engineers. Membership in one of these organizations is not automat- ic. Applicants are required to have certain certifications, meet professional standards and meet or exceed other requirements before they are admitted. Before any work begins, verify that all the required building permits are in place. Most companies will file permits on your behalf at the local building codes office. But don't assume that it has happened. Check with the permitting office first. Work done without proper permits could result in a fine and time delay. Have a load cal- culation done before installing a new sys- tem in any building. The best companies perform a thorough calculation rather than estimate. Buildings change over time due to foundations crack- ing or settling. It will affect the effi- ciency of any equip- ment. The HVAC com- pany shouldn't use the old unit to deter- mine the proper size of a new one. If your old unit was inadequate, you will want to install a unit that is a different size. Speak with your HVAC installer to determine the right size and model for you. Ask your HVAC contractor to perform annual checkups to verify that the unit is running at peak efficiency. With these tips, you can choose a reli- able HVAC business that will help you for years to come. H OW TO CHOOSE AN HVAC COMPANY WHAT YOU SHOULD KNOW k j Good word of mouth can go a long way when looking for the best HVAC company. Your town's building inspection office may also be able to provide informa- tion about local companies. k j Reputable HVAC companies will usually belong to profes- siona and trade organizations, but membership does not auto- matically mean high quality. The proper size of the new unit should not be determined by the old one.